The Empress Bouquet design offers a modern interpretation of 18th-century Chinese print work. The exquisite floral motif with gold and platinum detailing embellishes this Vintage under-counter sink. Each basin showcases a slightly different variation of the pattern, creating a one-of-a-kind focal point for your bath or powder room. With its gently curved, organic shape, the Iron Plains sink combines distinctive style with the extreme durability, strength, and vintage soul of KOHLER enameled cast iron. Two installation options - drop-in or under-mount - make this sink a flexible choice for a wide range of bathroom configurations. The Kelston collection brings warmth and style to the bathroom. With its elliptical lines and eye-catching curves, this Kelston sink offers a versatile design choice that fits both traditional and contemporary bathrooms. 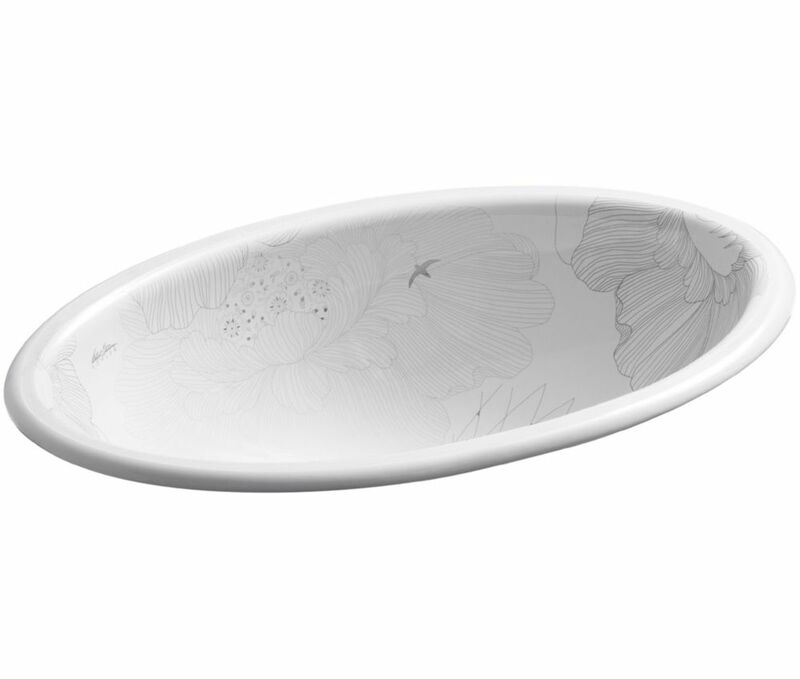 This under-mount basin shape is ideal for small bathrooms and powder rooms. The unique geometry of Ledges creates a look that is modern and functional. Wet surface ledges flank both sides of this gently sloped basin, providing extra workspace and storage for everyday items like toothbrushes and contact lenses. Empress Bouquet(TM) on Vintage(R) under-mount bathroom sink The Empress Bouquet design offers a modern interpretation of 18th-century Chinese print work. The exquisite floral motif with gold and platinum detailing embellishes this Vintage under-counter sink. Each basin showcases a slightly different variation of the pattern, creating a one-of-a-kind focal point for your bath or powder room.